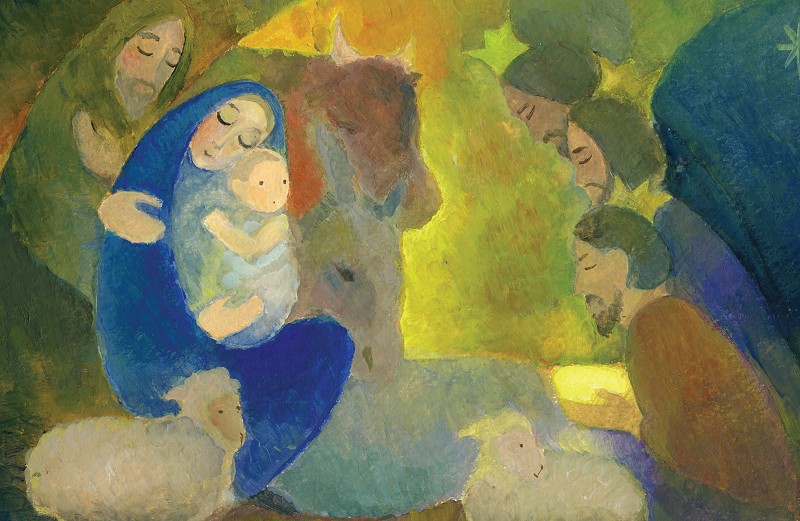 From our Christmas double issue, author, educator and lay missionary Frances Hogan writes on the Holy Family, and the Birth of Christ. Read the full article below, or click here to print of download a PDF of the article. Christmas! We look forward to gifts, the family gathering and all the joys of the day and the season. And rightly so! But it was very different for Mary and Joseph. Mary was about to give birth to her first and only child, and she did not even have the normal joy of giving birth at home surrounded by the friends and neighbours who would help her. Her last days of pregnancy were spent on the road, due to an edict of the far-away Emperor who wanted to increase taxes on his conquered lands. To comply with this edict everyone had to go to their ancestral place to register, regardless of cost or trouble. Because of this, Bethlehem was crowded, with all the noise, hassle and fuss which ensued. The very sight of a woman ready to give birth was enough to make the innkeepers say there was no room. Who needed a birth on top of all this? Mary and Joseph were passed over … and over again. There were no hearts in Bethlehem ready for the coming of the Son of David. The serenity of Mary in this event is something we should contemplate. It must have been Joseph’s one consolation! His anxiety and distress is something we do not consider at all; in fact, he is almost forgotten at Christmas, as if he had no part in this mighty event that changed world history. Mary’s silent trust in God the Father to take good care of his Son was total, so when the only thing left in Bethlehem was a stable, Mary accepted – partly because time was not in her favour! The birth was to take place here, now, ready or not! This was God’s kairos; time for the birth of the Son of God, son of Mary, son of Abraham, son of David and adopted son of Joseph, who was in the direct line of descent from King David (Mt 1). The humility of God is revealed in the humility of the birth of his Beloved Son, who needed none of the trappings of power or earthly glory to reveal his importance. The contrast with the Emperor in Rome is great. Caesar had all the trappings of earthly power and glory, but by comparison with this child of Mary was only a puff of wind! He passed out of history leaving little trace, whereas Mary’s child changed history forever, and he is known, loved or hated throughout the world for all time. Everyone must say ‘yes’ or ‘no’ to him, with eternal consequences. Jesus’ greatness was proclaimed from the heavens, where he was recognised, loved and glorified. The angel of the Lord appeared to some shepherds in the fields of Bethlehem announcing ‘news of great joy’ to the world. Why did the messenger from God the Father bypass the Sanhedrin for this announcement? They were, by all appearances, God’s official representatives on earth. Why did he bypass Caesar and all others who thought they were vital to history, politics or religion? The prophet Isaiah explains: ‘For my thoughts are not your thoughts, my ways are not your ways – it is the Lord who speaks. Yes, the heavens are as high above the earth as my ways are above your ways, my thoughts above your thoughts’ (Is 55:8-9). We began this reflection by looking to our own preparations, but now the angels tell us to look to the heavens where the real and eternal celebrations take place!